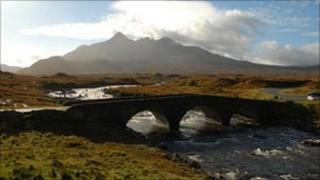 Skye has been voted one of Europe's top island holiday spots, beating sunnier climes like Sicily and Croatia's Hvar. The Misty Isle came eighth in the Top 10 European Islands category of Conde Nast Traveller's Readers' Choice Awards. The Old Course Hotel in St Andrews, the Turnberry Resort and the Gleneagles hotel were also named in the Top 20 European Resorts category. Ardanaiseig Hotel at Loch Awe was named as the UK's third best leisure hotel. This was the highest rating for a Scottish hotel, and it also made it into the World's Overall Travel Top 100 list. More than 25,000 people voted in the awards. The winners will feature in the November issue of the magazine. Malcolm Roughead, chief executive of Visit Scotland, said: "The results of this survey are fantastic news for Scotland, especially as they are voted for by visitors themselves. "Skye plays a prominent role in our "Meet the Scots" campaign, a European marketing drive which is expected to generate £85m for the Scottish economy. "Having such high quality locations and businesses in Scotland is crucial to the success of our marketing of the country." Tourism Minister Jim Mather added: "I am delighted to congratulate the picturesque, evocative and timeless Isle of Skye and all those across Scottish tourism who have been highlighted as being among the best of the international travel community."